In Rectifiers, MAKKAYS is the sole representative of world famous brand POWER ONE in Pakistan. Power One is the world largest provider of power conversion and power management solutions and has a long history of providing leading edge, innovative power solutions. Power-One revolutionized power conversion though the introduction of digital power. 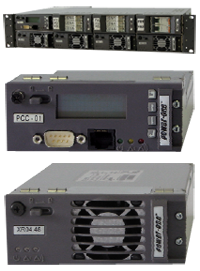 Power-One offers the industry’s premier line of standard products , for Network Power, AC-DC and DC-DC power conversion , as well as a host of products for application specific power conversion. For more details if required please log on to http://www.power-one.com. -48V, 19”/ETSI compatible compact power systems for loads up to 4.8kW. Achieve full power without derating up to 65°C. Available in 1RU and 2RU configurations for small space applications. Green: >95% typical efficiency utilizing the highly-efficient XPGe12.48 rectifier to save operating costs and reduce carbon footprints. Compact: High-density (21.8W/in³) rectifiers with numerous possible configurations up to 4.8kW in a 19 inch/2RU, ETSI-depth rack. Connected: State-of-the-art system controller with self-guided operation. Simple Network Management Protocol (SNMP) and web compatible. Sophisticated management features extend the battery life and monitor critical site equipment, such as HVAC and generators. Accessible: Slide-out shelf option allows front access for all connections. Rugged: Design caters to reliable operation when grid-level power quality supply is unstable. 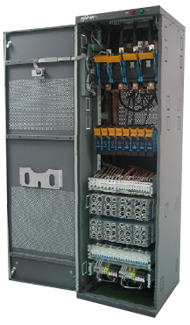 Available as 23” cabinet and 19” integrated medium -48V power systems for telecom networks. A host of modular configurations, scalable up to 26kW with intelligent control, are readily available to meet complete power needs. The Access systems are designed for the Guardian rectifier family (FMP/FMPe) with modules available with >96% efficiency. Avaible model list. Powerful – High density (31.3 W/in³) rectifiers with configurable configurations up to 26.1 kW and 720 Ah battery backup per cabinet. Connected – State-of-the-art system controller with selfguided operation. SNMP and web compatible. Intelligent – Sophisticated management features extend the battery life and monitor critical site equipment such as HVAC and generators. Rugged – Design caters for poor grid quality supply. Powerful – High density (31.3 W/in³) rectifiers with configurable up to 69.6 kW per cabinet; Maximum 185.6 kW when paralleled. In Pakistan we have delivered Power-One rectifier system to various telecom operators mainly to Telenor, PTCL, WorldCall etc and other various organization. In Telenor 60% install base is from Power-One. MAKKAYS have regional support offices in all major cities of Pakistan i-e Islamabad, Lahore, Karachi, Peshawar, Multan and Faisalabad. We have fully equipped PSD labs in Islamabad, Lahore and Karachi for repair and maintenance of Rectifier.